Corinne Joy Brown’s book, Come and Get It! 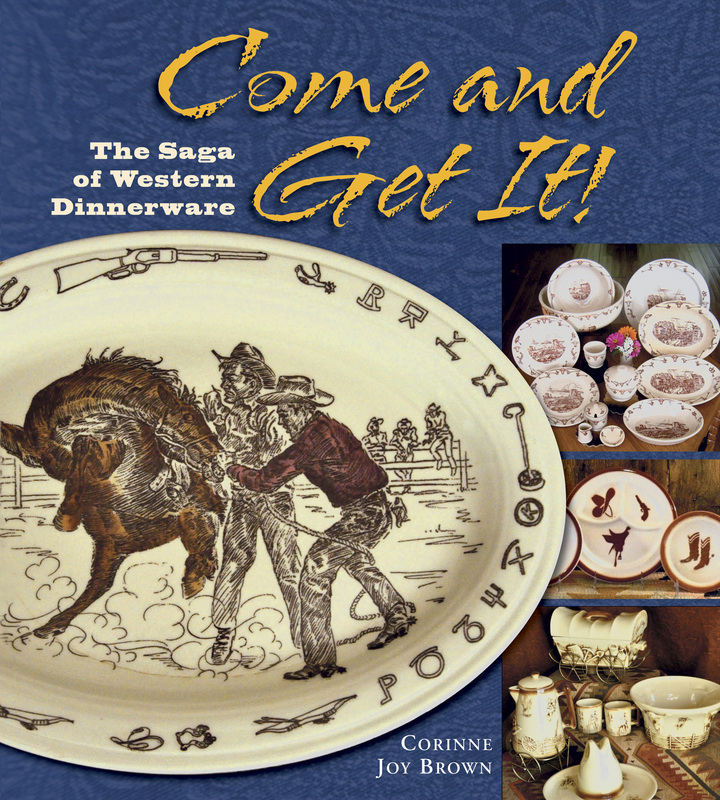 The Saga of Western Dinnerware (Johnson Books; $29.95), is just plain cool. I say this as someone not normally known for paying much attention to — let alone raving about — dinnerware. When it arrived, I noticed that the publisher calls it “the first complete archive of vintage and contemporary Western dinnerware.” Talk about specialized, I thought … and then I opened the oversize, full-color, glossy book. Wow. If this book appeals to a neophyte such as myself, imagine what it will do for someone who collects all things Western. At first I tucked into the text at random — and found I couldn’t put the book down, so I flipped back to the beginning and dove in. The book manages a solid overview of the popular cultural aspects of the modern West, while at the same time covering every conceivable aspect of the history of Western dinnerware. It covers collectors and collecting, resurrected lines, discontinued lines, modern makers, the future of Western dinnerware, and lots more. And an extensive bibliography and index top off the offerings. If this book has any say in the matter, the future of Western dinnerware is a bright one. 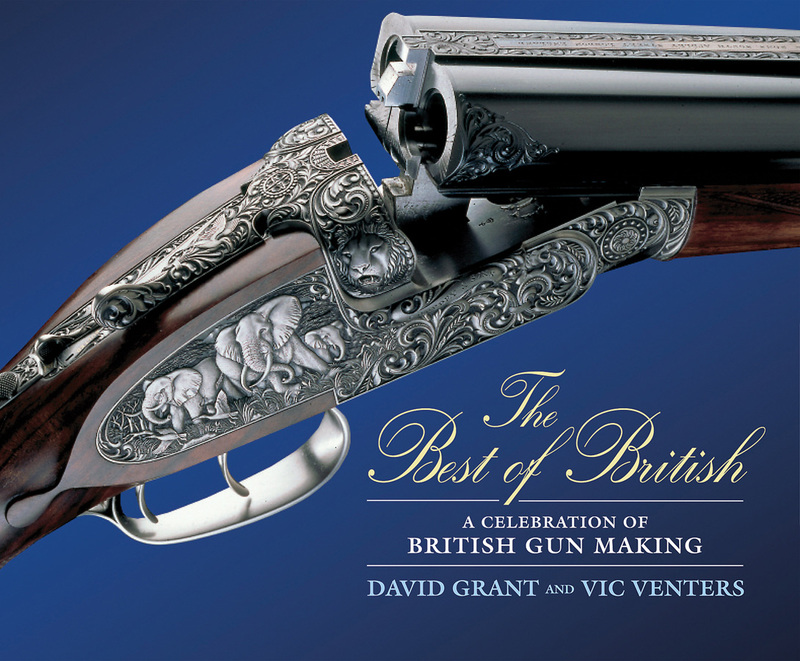 With the arrival of The Best of British: A Celebration of British Gunmaking (Stackpole Books, $69.95), I doubt I’ll see a more sumptuous or well-presented book this year. Each of the men behind it, photographer David Grant and author Vic Venters, is a standout in the fine-gun world, highly respected for his obvious talents displayed within these pages. This book affords people the world over, and certainly in the American West, where many fine-gun collectors reside, the chance to see, up close and personal, guns that are oft mentioned, though rarely seen. The book is a document of the resurgence of these quality sporting guns and testament to the skills of their makers. The 176-page, full-color hardcover offers rich, achingly sharp close-up photographs of these most exquisite British guns, with special emphasis on pieces made in the past three decades, along with spot-on, detailed captions accompanying each photo. Choosing one word to define this book is an easy matter: stunning. The reader will lose himself in the rich photographs. I am by no means a fine-gun aficionado, but I can appreciate the singular craftsmanship imbued in each piece of functional art represented herein. There is something eminently pleasing about seeing the results of the multiple mastered art forms — engraving, woodwork, precision milling — that must work in concert to create such stunning works of art. All the names are here: Purdey, Greener, David McKay Brown, Holland & Holland, Boss, and many more. An appendix at the back of the book offers an index, along with gunmaker information and addresses. Each listing is a readable summarized history of the makers included in the book. And as an added bonus, author Vic Venters has also written the new book, Gun Craft: Fine Guns & Gunmakers in the 21st Century (Shooting Sportsman Books; $30). Though by a different publisher, the book could well be considered a companion piece to The Best of British. It, too, is loaded with stunning color photographs, plus charts and diagrams, and offers hundreds of pages of well-written, detailed text by noted fine-gun authority Venters. This pair of books should be required reading — and viewing — for all connoisseurs of fine guns and their inherent artistry. 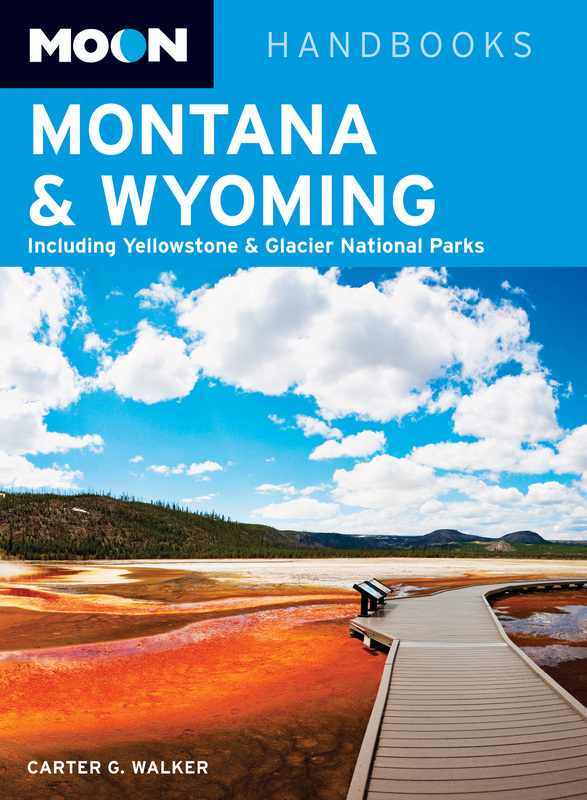 With Moon Handbooks’ Montana & Wyoming: Including Yellowstone & Glacier National Parks (Avalon Travel; $19.99), Carter G. Walker sets a new standard for guidebooks to our stunning region. The book is written in clean, clear, engaging prose that is at once inviting and informative. Walker, an expert on the region (and a regular contributor to BSJ, opts for the appreciated arm-around-the-shoulder approach instead of the at-arms’-length approach found in so many other popular guides. This book, as with the others in the Moon Handbooks line, isn’t about cute color photographs on glossy paper that sacrifice function over form. It’s a serious reference resource meant to be used before, during and after a trip. The 30-page, front-of-the-book color section offers several detailed and vital maps of the region, as well as quick itineraries to whet the reader’s appetite (“The 14-Day Greater Yellowstone Loop,” “Seven-Day Glacier Road Trip”), before delving into the book’s meat. A wealth of details about primary regions of each state, plus the parks, are given ample room in these 500 pages. 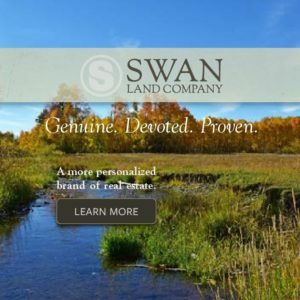 And readers will find informative photographs and useful, uncluttered maps judiciously dispersed throughout, as well as copious tips on shopping, biking, hiking, hot springs, restaurants, museums … oh my! If it’s in Montana or Wyoming, odds are it’s mentioned in this book. All of this useful information and more is bookended with contents pages that are thorough without bogging in annoying minutiae, and solid end-of-book resources and index sections, as well as a list of the book’s maps for quick reference. The guide feels sturdy enough to withstand jostling on a dashboard or in a backpack (though water-resistant covers would be a welcome addition). Moon Handbooks’ Montana & Wyoming is a one-stop shop for anyone who needs to know the who, what, when, where, and why of touring in Montana and Wyoming (and Yellowstone and Glacier National Parks!). Visitors — and dreamers — will be hard-pressed to find a better-written, more comprehensive reference to our beloved, stunning Northern Rockies region. 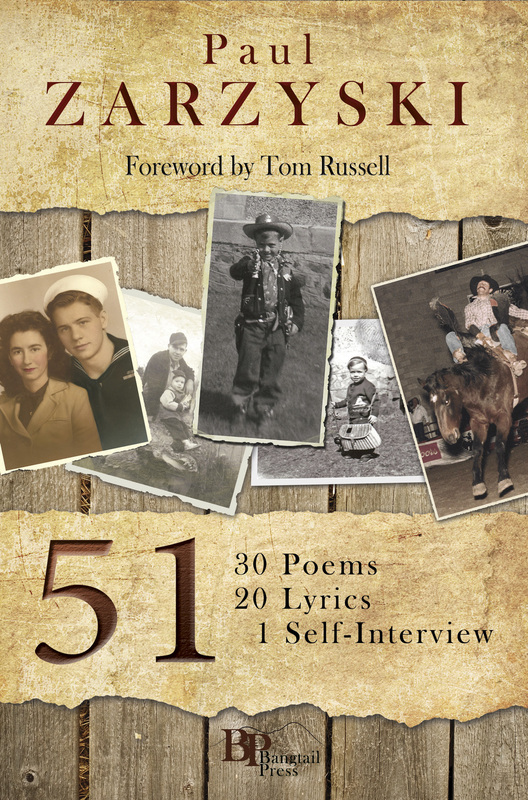 With 51: 30 Poems, 20 Lyrics, 1 Self-Interview (Bangtail Press; $19.95), the multi-award-winning poet-performer Paul Zarzyski has come up with a book that surpasses his previous efforts — and that’s saying something. Though it’s a tasty fruit salad of offerings, as the title suggests, the entire book reads like a big, complex and wonderful memoir. There’s an abundance of love, grief, insight, pain, humor and wit within its pages. 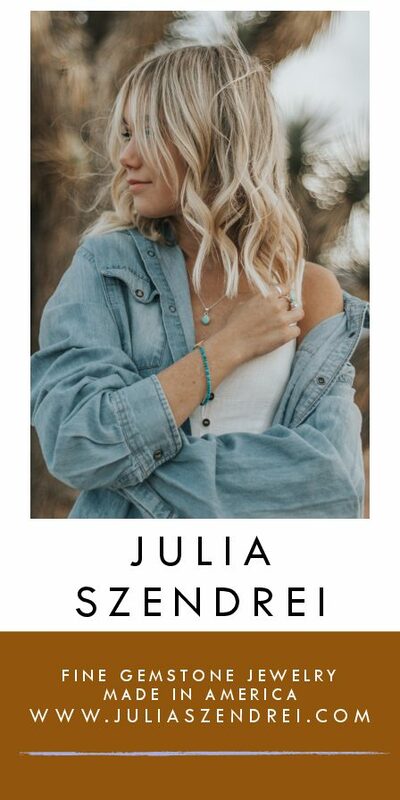 Indeed, 51 hits hard, deep and often, and gives readers a special glimpse into Zarzyski’s robust thoughts and feelings throughout a (so far!) varied and vibrant life. This creative man’s passions are contagious, his life full, his writing rich — and deserving of your time. In Bull Trout’s Gift (University of Nebraska Press; $21.95), the elders of the Confederated Salish and Kootenai Tribes relate the importance of the 50-mile Jocko River and its ailing native bull trout population to the Salish and Pend d’Oreille people and the surrounding landscape. This long, complex interdependence with the river — and current large-scale watershed restoration efforts — is explained through thoughtful text by Johnny Arlee and full-color illustrations by Sashay Camel. 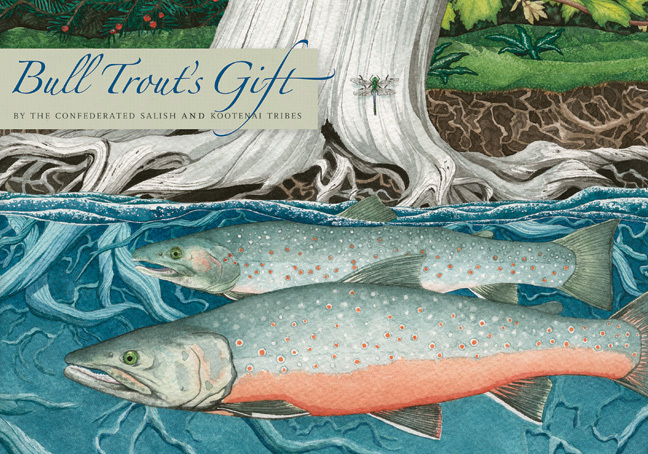 Bull Trout’s Gift is a standalone book, and is also offered as one third of a two-book and DVD set, Explore the River Educational Project, which consists of Bull Trout’s Gift, a 120 page, illustrated softcover Field Journal and the interactive Explore the River DVD that offers more than 60 hours of material for audiences of all ages. 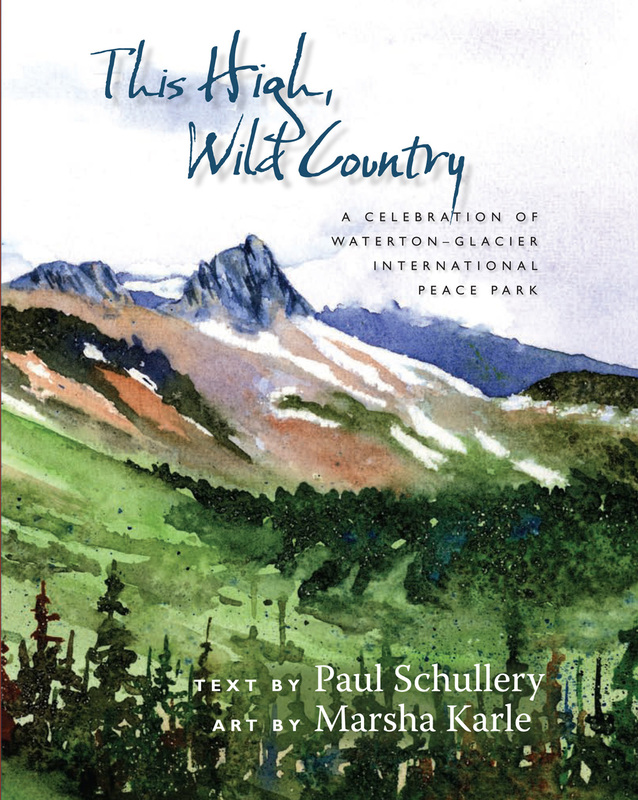 This High, Wild Country: A Celebration of Waterton-Glacier International Peace Park (University of New Mexico Press; $27.95) by historian-naturalist Paul Schullery and his wife, artist and longtime National Park Service employee, Marsha Karle, is a lovingly crafted homage to Waterton-Glacier International Peace Park on the occasion of Glacier National Park’s 100th anniversary in 2010. Schullery began visiting Waterton-Glacier International Peace Park more than 30 years ago when, as a young man, he traveled alone throughout its natural wonders. Since then, he and Karle have returned many times. The accompanying artwork (66 color illustrations, 27 drawings, and a handy map), stunning watercolors worthy of gallery space, nicely balances Schullery’s words. From the small, sepia-color inset illustrations (bear hair caught in a barbed-wire fence; a child snacking on huckleberries; a hand holding a Swiss Army knife) to partial and full-page, full-color watercolor paintings of all manner of natural wonder (grizzlies; deer in an aspen grove; high mountain peaks, their snowed sides melting to reveal the greening slopes of spring). The book is a comfortable 142-page softcover filled with informative, comic and poignant moments describing a singularly beautiful place and its history, man-made and natural. Who knew learning could be so fun, so personal and so handsome?